This is a fun and interesting way to serve cocktail frankfurts. A friend of mine served these at an undersea themed birthday party last year, and I just had to try them for myself. 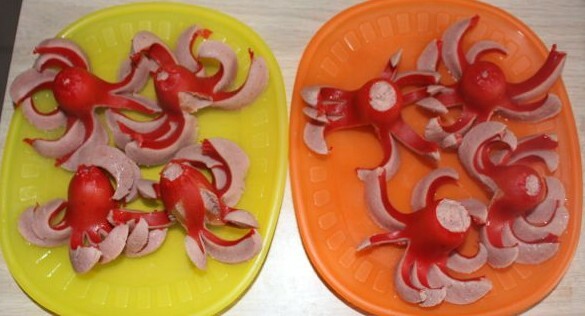 Surprisingly easy to make, the kids often ask for their frankfurts to be made into octopuses now. I use a sharp knife to cut into each frankfurt starting from about half-way up, slicing through the bottom half length-ways. Then I turn the frankfurt around and cut it through again, so now the bottom half is in quarters lengthways. Then each quarter is cut in half again to make eight tentacles. I have found it just as easy to cut through the two opposite quarters of the frankfurt at the same time, as it is to tackle each quarter separately. Cut up ready to cook. 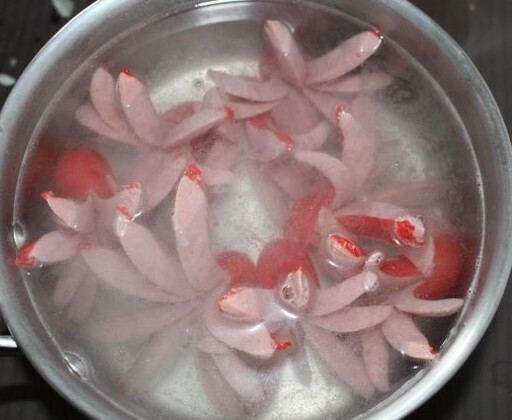 Once the frankfurts are cooking, either on the stove top, or in the microwave, the tentacles will start to curl up and out, giving the frankfurts an octopus look. The kids like to have tomato sauce with their frankfurts. They dip the octopus’ tentacles into the sauce and bite them off. 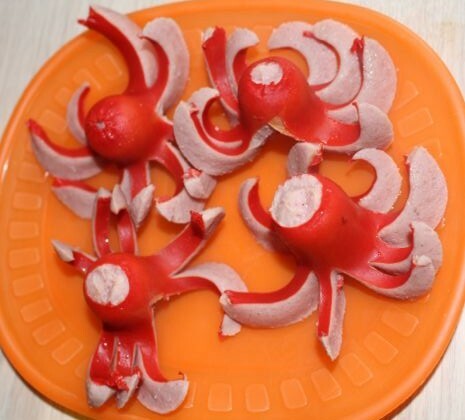 While they were eating, I heard a lot of “I have a four-leg octopus” and “I have a no leg octopus!”. L even exclaimed she had a “no-head octopus” after she bit the top off her frankfurt. Frankfurt octopuses ready to eat.